The von Trapp story can be told and retold and an audience will be there for the The Sound of Music There was an excellent set from Scenic Projects. When lit it took on another dimension. All the scene changes were effectively achieved. The sound needed a little adjusting as performers now rely on amplification rather than projection to put their songs and dialogue across. Costumes from Charades of St Helens complemented the scenery and, created the right look for each character. With correct hair styles and correct footwear the picture was completed. Based on a real-life story the characters are so well known because of the 1965 film. This makes it difficult for an actor to bring something new and fresh to the piece. Creatively the production team presented a refreshing revival of this iconic musical. The cloister opening of Nonnberg Abbey included the daily routine of the Nuns, resulting in the excellent singing of Preludium (in Latin of course). All the choral singing from the Nuns set the bar high for the rest of the show. Tina Lynn-Spiers, as the Mother Abbess, portrayed the character's sensitivity and was musically very strong. The other sisters, who hadn’t taken a vow of silence, added to the narrative. The von Trapp children (team jam) were played by Master Shotton, Miss Clifford, Master Croxford, Miss MacDonald, Miss Churbak and Miss Philips. They were polished in their performances and didn’t rely on the "Ahhhhh" factor. Sasha Carrillo de Albornoz, as the eldest daughter, Liesl, showed the aches and pains of a teenager. Her first love, Rolf, gets brain washed by the Nazi war machine but revealed remorse as the family escapes the Nazi regime. Rory Gradon, as Rolf, displayed an understanding of the character and rose to the challenge the role presented. New love for the widowed Georg is Elsa Schraeder, who has to be in love and graceful as she withdraws when the attraction between her fiancée and the governess blossoms. Bonnie Lazzarini gave Elsa all the airs and graces and showed just enough emotion for a woman nobly born. There has to be a touch of light relief in a drama and the character of Max Detweiller supplies just that. Bob Chaloner used his experience to make Max amusing. 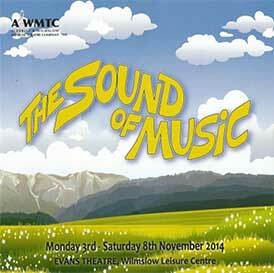 The head of the household, Georg von Trapp, has to change from a stern captain to a lover. Richard Ross ticked most of the boxes. There were some tuning issues but, on the whole, presented a rounded character. Now the role of Maria has to fit the audience’s profile and Kimberley Edge fitted their perception. She also blended in her own interpretation; she was a problem for the Nuns, fun for the kids and showed loving feelings. Everyone else helped to make this production an entertaining show “So Long, Farewell”.